B2GOLD, the Toronto-listed gold producer, set its sights on cash flow from operations of $390m in the 2019 financial year on the back of higher gold production, assuming a gold price of $1,250 per ounce. Commenting in a production update, in which it confirmed production last year at the upper end of guidance at some 953,504 oz – representing a year-on-year increase of about 51% – the company said output for this year would be in a range of 935,000 and 975,000 oz. The reason for the massive leap in production in 2018 was the commissioning of its Fekola gold mine in Mali in late 2017. Fekola mine alone produced some 439,068 oz exceeding the firm’s stated guidance of between 420,000 and 430,000 oz. There were also strong operational showings from Masbate mine in the Philippines. The company’s other African asset is Otjikoto in Namibia which produced 167,346 oz and was in the mid-point of its production guidance range. This was the tenth consecutive year that B2Gold achieved record annual consolidated gold production, it said in its update. The strong production numbers enabled it to ease pressure on the balance sheet. Some $259m in convertible senior subordinated notes was repaid in full in October and total debt outstanding was reduced to $480m from $700m at the beginning of 2018. It didn’t state a debt reduction target for the current year. “In 2019, B2Gold remains well positioned for continued strong operational and financial performance with consolidated gold production forecast to be in the range of between 935,000 and 975,000 oz,” it said. All-in sustaining costs (AISC) are forecast to be between $835 and $875/oz which compares to 2018 guidance of $780 and $830/oz. 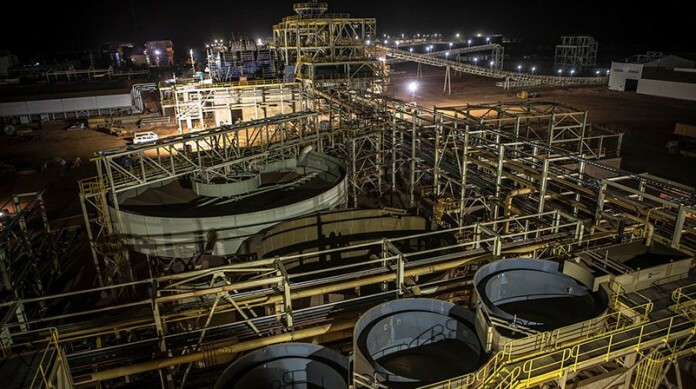 “The budgeted 6% increase in AISC per ounce over 2018 guidance, mainly relates to slightly higher forecast cash operating costs and higher expected pre-stripping sustaining capital costs at Otjikoto,” it said. B2Gold CEO, Clive Johnson, has been connected with merger and acquisition activity. He told Reuters last year following the announced merger of Barrick Gold with Randgold Resources that: “If there are opportunities in West Africa that don’t perhaps fit the new Barrick model, in terms of the size of project, or other things, then we’d be keen to look”. He said at the time he was interested in mines of not less than 200,000 ounces a year in production for a life mine of 10 years. However, the main thrust of gold reserve growth or replacement is by organically expanding the companies existing mines. Accordingly, B2Gold said it was planning “… another year of aggressive exploration in 2019 with a budget of approximately $43m”. Of this some $21m would be spent on exploration in Mali, Burkina Faso and Ghana, it said.